Our Annual General Meeting will take place in Westmnster Cathedral Hall at 11.30am on Saturday 20th July. Our guest speaker will be the Rt Rev. Michael Campbell OSA, Bishop Emeritus of Lancaster, who will celebrate Pontifical High Mass at the High Altar of the Cathedral at 2.30pm. A buffet lunch - which must be booked in advance - will be provided for paid-up members, To book, please complete the form below. 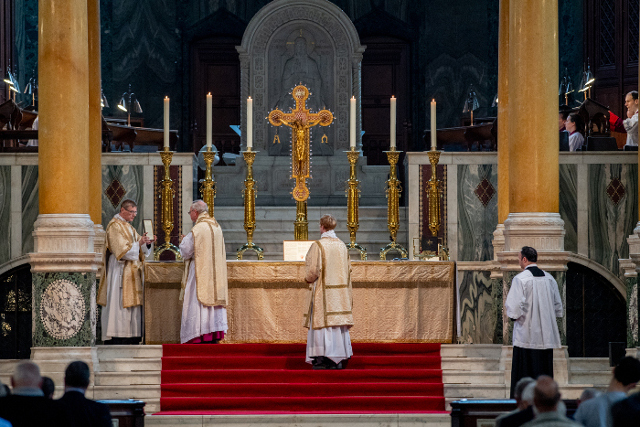 Picture: The Last Gospel during High Mass following the 2018 AGM. © John Aron.